We were thrilled to host our fourth g4g day @Krakow, Poland, in partnership with the fabulous Cisco team, AGH, ABB, Aptiv, GE Healthcare and Nokia! This year, we invited 150 girls aged 10-14 to participate in interactive workshops to discover STEM (Science, Technology, Engineering, Math). This whole exciting and free event took place in the buildings of the Department of Telecommunications and the Department of Computer Science of the AGH University of Science and Technology in Krakow! The girls had the opportunity to explore hands-on workshop and interact with role-models from the profession. When? Saturday, September 22, 2018 between 9 a.m. -­ 16 p.m.
What? Welcoming 150 girls aged 10-16 from local schools to come and join us for a g4g Day event filled with interactive and hands-on fun in Science, Technology, Engineering and Mathematics. How? We invite role model professionals to lead 45 minute workshops that demonstrates the link to STEM; 10 - 12 girls in one workshop; and a chance to experience 4 workshops throughout the day. Marta has been working for cisco since Feb 2013. Currently as a Business Analyst for Business Intelligence and Analytics team. Privately, mum to 2 year old Sebastian, fan of star wars. In her free time she loves reading, playing board games, watching Sci-fi series, traveling and running. One of our project coordinators for g4g in Krakow, Anna Toporkiewicz joined Cisco in October 2013 as a BI Analyst in GBS BI team and loves creating stories based on the numbers provided :). She likes challenges, process improvements and project management. In her free time, she loves cooking, travelling and meeting with people. Ewa has been working for Cisco since Apr 2014 as Global Customs Risks and Audit Analyst. Outside of office, she enjoys good food, traveling and CrossFit training. Crazy cat lady and huge fan of football. Karolina has started her journey with Cisco in April 2018 while joining IT Regional Team. Open-mindedness, willing to help the others as well as positive way of thinking helped her to step into new role as a Project Manager and lead small internal projects with a great passion and a can-do attitude. After working hours, she loves to improve language skills, cook Moroccan meals and enjoy waves on the Canary Islands. One of our project coordinators for g4g in Krakow, Karolina has joined Cisco in 2014 as a Data Specialist in payroll team, now working as a combination of Continuous Improvement specialist and Business Analyst. She has maths background so naturally she likes numbers and analytics. Personally a mum of a girl and an equal rights believer. Plays flute and sings in Cisco choir. I am an IT Engineer at Cisco. I enjoy coding in Python, brain teasers and getting to know new technologies. A huge fan of Friends who also enjoys reading books and starts beautiful and exciting adventure of travelling around the world. Justyna has been working in Cisco since April 2017 as administrative assistant in Customer Experience Team. After working hours she loves hiking and traveling. Karolina has been working for Cisco since September 2017 as Project Manager in Digitization team. In spare time, Karolina is enjoying concerts and music festivals, reading crime books, attending spinning classes and travelling around the world (24 countries on the “scratch map” so far). 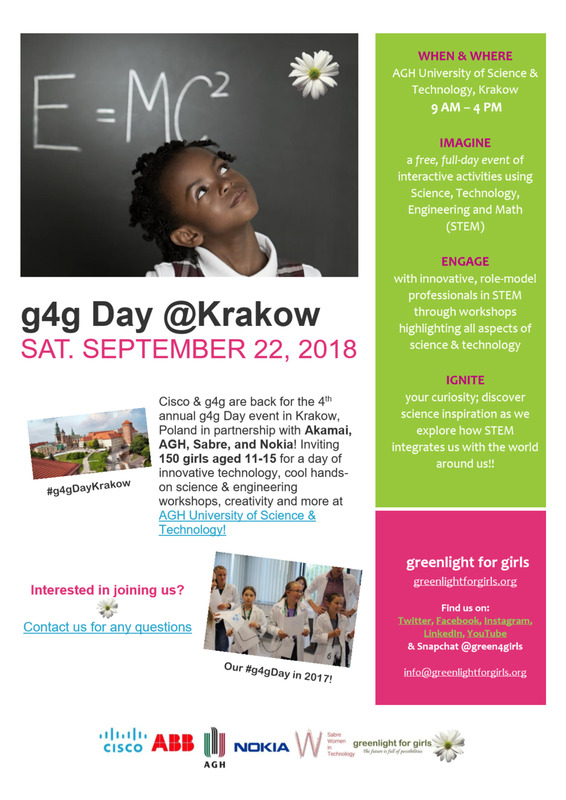 On Sept. 22 we sent Alex and Marie to Poland to participate to an amazing 4th g4g Day @Krakow with Cisco Kraków and so many incredible partners! 145 girls aged 10-15 joined us for a full day of STEM discovery. At the AGH University, the girls got to explore interactive and techy workshops such as “Design thinking with Harry Potter”, “Cars of the future”, “Robot Turtles Coding Game” … Intrigued? You should be! Have a look at our photo album here and be ready for more photos to come soon! A massive thank you to Kinga Górska for the beautiful photos and a huge thank you to the brilliant Anna Barker, AS Director at Cisco, who accepted to be our guest speaker of the day, and to all our partners : ABB , Akademia Górniczo-Hutnicza w Krakowie , Aon Poland Careers , Aptiv , GE Healthcare , Inside Guidewire , Krea-Tech, Ocado Technology , Motorola, Nokia , Stanley Black & Decker , Relativity , ROBOTOWO , Sabre Poland and Sii Polska ! Click here to see all the pictures from the event! In 2017, in partnership with the fabulous Cisco team, Akamai, AGH, Sabre and Nokia, we hosted the 3rd annual g4g Day @Krakow event in Poland! These 200 girls came from the local community to experience another spectacular year of innovative technology, cool hands-on science workshops, creativity and much more!